Professor Barbara Burlingame provided a compelling case study about the nutrient content of local bananas at our February conference. Before returning to New Zealand she spent 16 years with the UN’s Food and Agriculture Organisation including the last four as Deputy Director of the Nutrition Division as was closely involved with the research referred to here. Professor Burlingame related the story of Pohnpei, a Micronesian Island north of the equator. Over time the people their drifted away from their indigenous diet to consuming increasing quantities of imported food. There were consequences. The change in food habits from fresh traditional foods to processed imported foods has been accompanied by high prevalence of overweight, obesity, diabetes, heart disease and cancer among the adult population, while micronutrient deficiencies, such as of vitamin A, are prevalent among children. Starting in the 1960s, the United States Department of Agriculture (USDA) initiated supplementary feeding programmes to Pohnpei, using surplus commodities such as rice and tinned foods. These food aid programmes, including a school lunch programme, “introduced rice and processed foods to many children and adults in Pohnpei, establishing new food habits, attitudes and food tastes that persist today”. In a story similar to that of other indigenous communities transitioning from the food systems they controlled to Western diets, the unintended consequences, especially the vitamin A deficiency, sparked further inteventions. Vitamin A supplements, including injections, were provided for children. Researchers, led by the late Dr Lois Englberger, turned their attention to local foods. Pohnpei has 26 banana cultivars. One of these, Karat, has deep yellow/orange flesh indicating the presence of provitamin A carotenoids. When analysed for its nutrient profile, the Karat cultivar provided up to 2230 units of carotenes. Another cultivar, Utin Lap has up to 8508 units of carotenes. By contrast, Cavendish, the variety found in supermarkets around the world has less than five units of carotenes. The answer to the debilitating vitamin A deficiency was close by all that time. Consequently the government of the Federated States of Micronesia championed the local food movement and when Dr Englberger died in 2011, they held a memorial service in her honour. The health of our food can be evaluated by the nutrients it provides and the impact of artificial chemicals used in its growing, processing, transportation and storage and impacted by the way we cook it. This website provides detailed coverage of bananas’ food value. Fruits and vegetables with orange or red flesh are rich in carotenes, so we can anticipate that our locally grown bananas will be closer to the levels found in Cavendish bananas. However, it will be interesting to have the analysis done. Perhaps we could crowdsource funding for this to support the development of the local banana industry. Professor Barbara Burlingame, professor of Public Health (Nutrition) is a keynote speaker at our conference. She has recently contributed to a chapter in Maintaining Agrobiodiversity in Sustainable Food Systems published by Bioversity International. Cover of Maintaining Agrobiodiversity in Sustainable Food Systems executive summary. Photo credit: Planting rice in Nepal. Bioversity International/Sriram Subedi, LI-BIRD, Lamjung. The executive summary of the 2017 publication is available now. Ann Tutwiler, the Director General of Bioversity International prefaces the document by stressing the importance of linking up and learning from diverse dimensions of biodiversity. Conserving agricultural biodiversity for use in sustainable food systems. Professor Burlingame contributed to chapter two, Agricultural biodiversity for healthy diverse diets. This chapter focuses on the desirability of diverse sustainable food systems delivering nutritious food to people. This image from chapter two shows a scene repeated around the world as communities come together to improve access and knowledge of healthy nutritious food. Its gratifying to know that in pursuing local food we are part of a global movement. I am looking forward to learning about this from the professor. 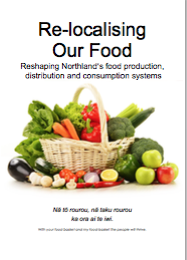 The venue is booked for our Local Food Conference – its all go! It is scheduled for 13 and 14 February 2017 at the Interactive Learning Centre at NorthTec. Anne Palmer of the Center for a Livable Future is confirmed as keynote speaker. You can read more about Anne here. Anne is Program Director for the Food Communities & Public Health Program. One of the roles of the Center for a Livable Future is as an information hub for North America’s 282 food policy councils. This positions the Center to monitor the activities of food policy councils and identify the policies and programmes having the greatest impact. This documentary highlights some of the positive developments towards more sustainable food systems in the United States. Anne was one of two content advisers for the video.